Startalk Is a Huge Success at TNCS! On Day 4 of Startalk camp, campers wore their “Let the World Be Filled with Love” tee-shirts in honor of the site evaluation by Startalk administrators! Being awarded a Startalk grant was just The New Century School‘s first step in quite an arduous process to come in order to “Let the World Be Filled with Love” (TNCS’s very own Startalk camp theme). Months of planning came next, followed by the proof in the pudding—implementation. Well, by only Day 5 of Startalk summer camp at TNCS, it’s exceeding all expectations, and all of the hard work is paying off! On the heels of Day 4’s hugely successful on-site evaluation by Startalk administrators, TNCS got the green light to keep up the great work (“We passed with flying colors!” said Director of Admissions Robin Munro happily). All week, our three groups (Novice Low, grades 1–2; Novice High/Intermediate Low, grades 2–3; and Novice Low, grades 3–4) have been busy, busy, busy—listening and learning, cooking and eating, singing and drumming, and engaging in Chinese cultural activities like calligraphy and learning the abacus (see slideshow below). Their progress in those 5 short days is nothing short of astounding; the Startalk methods really work! Ni hao! We learn to greet each other and introduce ourselves. Circle time is also a good time to get to know each other and start talking! All about us! We are making a board that features each member of our group. We are already able to read Chinese characters! 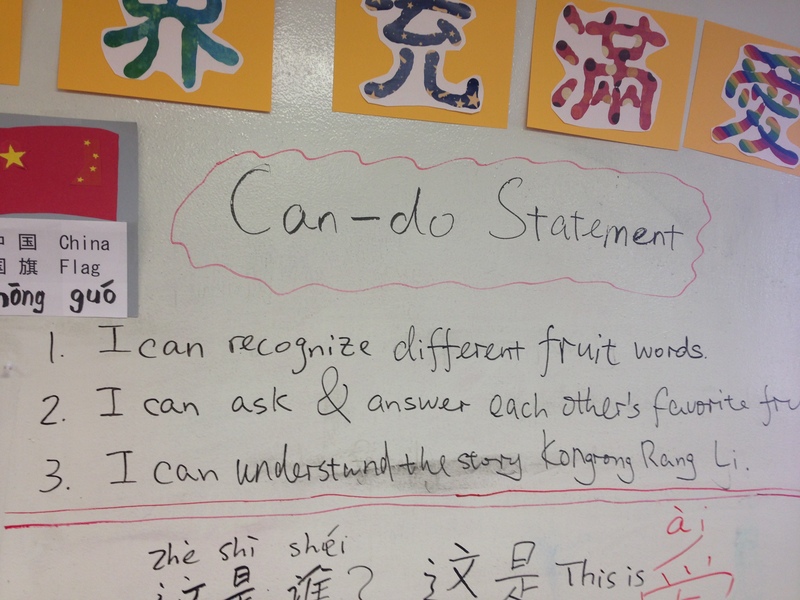 Li Laoshi leads her class; note the Can-Do statements board behind her. Chen Laoshi leads a group discussion. Practice, practice! Performance is a great confidence-builder and gets the campers communicating in Chinese. Students are truly immersed in the language, but the point is that, through the proven six-pronged approach, they develop the confidence to communicate—to start talking. Startalk also employs the 5 Cs of language acquisition developed by the American Council on the Teaching of Foreign Languages (ACTFL) that TNCS has been using all along in its multilingual language program curriculum. Communication, Culture, Connections, Comparisons, and Communities inform every language-learning activity the day holds. The most effective language program designs activities in which these five concepts intersect, which is exactly what “Let the World Be Filled with Love” achieves, as these photos eloquently demonstrate. By Day 5, campers were well acquainted with their daily routines and expectations. They are growing more comfortable communicating in Mandarin by the minute. 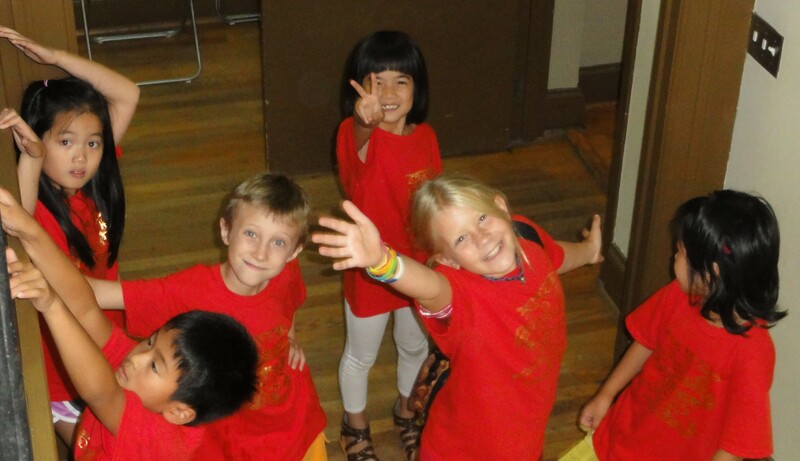 Novice-level campers went out on their first field trip to visit a Chinese immigrant family in their home. They will lunch together, do a craft, and talk. Being able to converse about fruit is one of the end-goals of camp. Intermediate-level campers enjoyed a more typical Startalk camp day, with group activity followed by a language/writing lesson, cultural enrichment, and finally language review. The video below shows them during their morning group activity. The 3-week program will culminate with a performance, which will take the form of a Farmer’s Market, in which Startalkers will adopt roles as buyers and sellers and enact transactions, from identifying fruit to describing it to bargaining for it. Today’s morning group activity was practice for the Farmer’s Market, and, as you’ll see, the kids are well on their way. Note how Liang Laoshi speaks very clearly, repeats her phrases several times, and accompanies her instructions with explanatory gestures but never utters a syllable in English! 1. I can recognize different fruit words. 2. I can ask and answer about favorite foods. 3. I can understand the story Kong Rang Li. Another ultimate goal, expressed as a can-do statement, is “I can understand the story of ‘Kong Rang Li’.” This traditional Chinese fable is about a little boy with five older brothers and one younger brother. When their father offers them pears, Kong Rang opts for the smallest one. When questioned by his father about his generosity, the boy replies that his older brothers are bigger and should therefore have the bigger pears, whereas he is older than his younger brother and should let him also have a bigger pear. The story demonstrates the core Chinese value of selflessness and also shows how to spread some love. 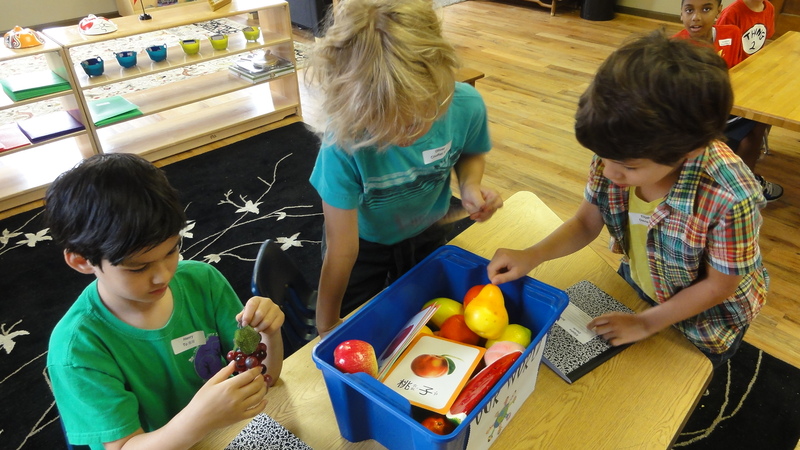 It’s the linchpin of TNCS’s Startalk camp, bringing everything together—the ability to discuss fruit, the love theme, and interacting with the story via several different media including reading, writing, and pantomiming. With only one week of Startalk under their belts so far, campers are already wonderfully enriched and enjoying every minute of their immersion in Chinese culture and language. By the end of Week 3, expect to witness some pretty incredible transformation! 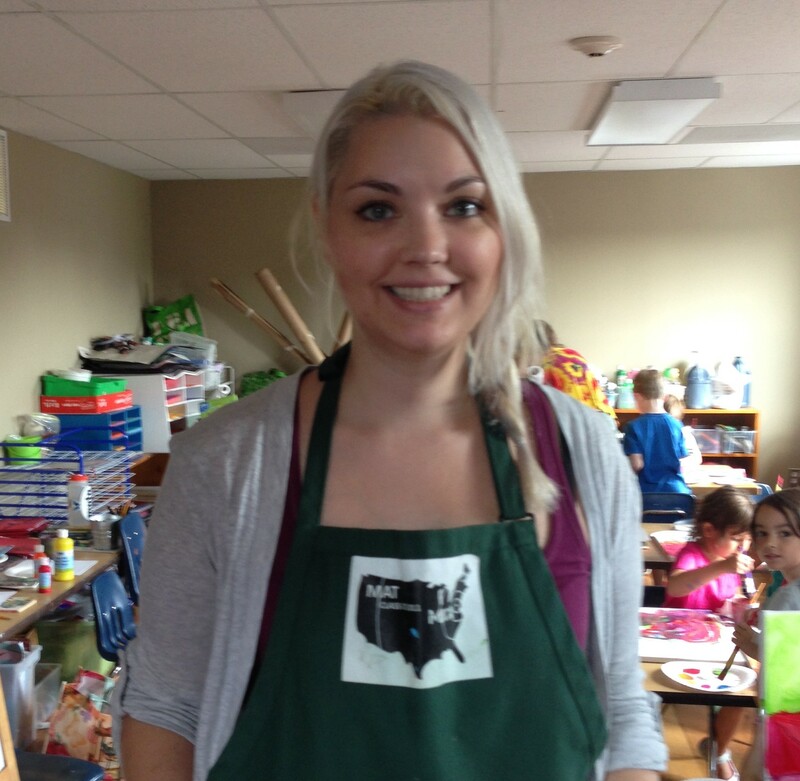 Although she is not new to The New Century School, Jennifer Hodapp is new to her administrative role as TNCS Summer Camp Director. Sra. Hodapp began at TNCS last year as a Spanish-speaking assistant teacher in the primary classrooms. 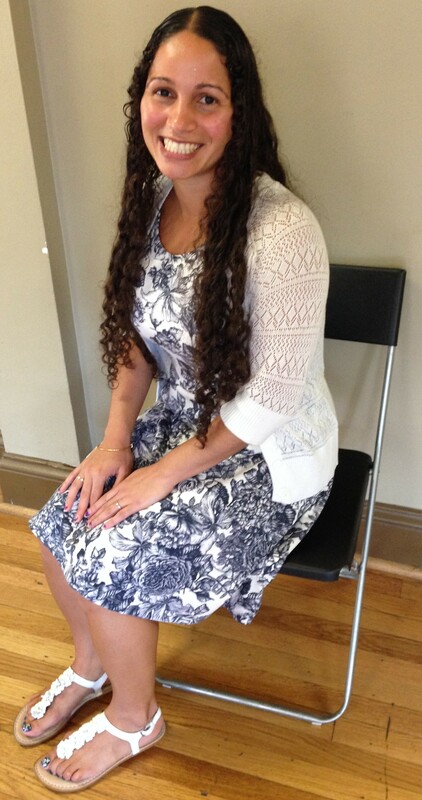 At the start of the 2014–2015 school year, she will take over the elementary Spanish program. And, in between, she is running summer camp like a seasoned pro! “From parent and staff feedback, I can say that camp is going well,” she said smiling. “In terms of organization, camp themes, and overall camper participation, everyone seems to be pleased with how this year is shaping up.” That’s no surprise, given Sra. Hodapp’s track record. She brings tremendous enthusiasm and commitment to whatever task she has turned her attention to at TNCS and beyond, as described in an earlier post this year. Although, in general, a lot has stayed the same over the course of the few years TNCS has offered summer camp, refinements have been made so that this year, the programming (divided into pre-primary, primary, and elementary) is especially exciting and well suited to the tastes of the bright, energetic campers in attendance. One aspect that particularly appeals to Sra. Hodapp—a “heritage” Spanish speaker and a firm believer in the benefits of multilingualism—is that pre-primary Spanish and Mandarin Immersion camps were merged, so that 2- and 3-year-old campers get both simultaneously. That might sound complicated, but it’s working, and Sra. Hodapp is hearing positive feedback. It may help that vocabulary is inspired by summery things, like the sea, so that the kids are already in that mindset. Sra. Hodapp observes when she can and is amazed to see how quickly the littlest campers are able to follow instructions given by instructors Sras. 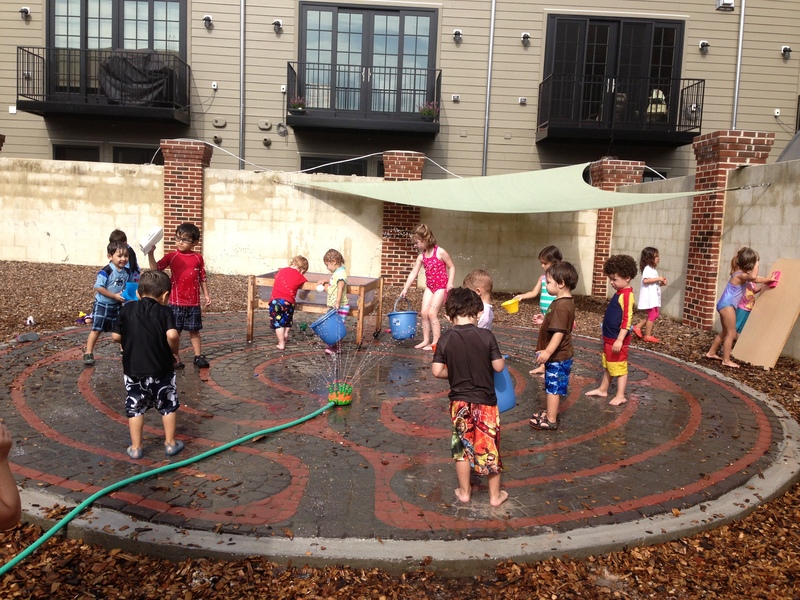 Ramos and Gonzalez and Li Laoshi, to get their own materials, and to find their places during “circle time.” Lucky pre-primary campers also get to participate in the popular carry-over from last year, Water Playday! Primary camps have progressed in 2-week blocks and have included Movement, Sing-a-Song, Cooking & Gardening, and Spanish Fiesta. Cooking and gardening, says Sra. Hodapp, is far and away the most popular so far (although summer is only half over, and there are plenty of great things ahead!). Elementary camps are largely third-party hosted, including Lego Camp, The Painting Workshop, and—exclusive to TNCS and grant-funded—Startalk. Welcome to TNCS summer camp! Another aspect that Sra. Hodapp says is a bit different this year is that a larger proportion of campers are not already-enrolled TNCS students. As part of its commitment to be a part of and to serve a larger community, TNCS welcomes kids from all over, from any school. This makes camp look and feel different from school, and this is also very important to Sra. Hodapp. “The kids are relaxed and enjoying this,” she said. “They’re having fun!” After all, this is summer break, and although that shouldn’t be an excuse to turn brains completely off, it should also offer kids the chance to lighten up a little (see “Making Summer Count” for more). Sra. Hodapp has this balance very much in mind and is making sure campers are engaged, happy, and having fun in creative and educational ways. Make no mistake—the kids really know the difference. If parents mistakenly refer to TNCS summer camp as “school,” their kids are quick to correct them: “No, this is camp!” Sounds like a clear indicator of its success! “I want to continue to grow here,” she said in closing. Doubtless, she will exceed this goal while contributing enormously to the school, as she has done since first joining the TNCS community! Enjoy the rest of the summer! The Painting Workshop at TNCS: Kids Paint the Town! 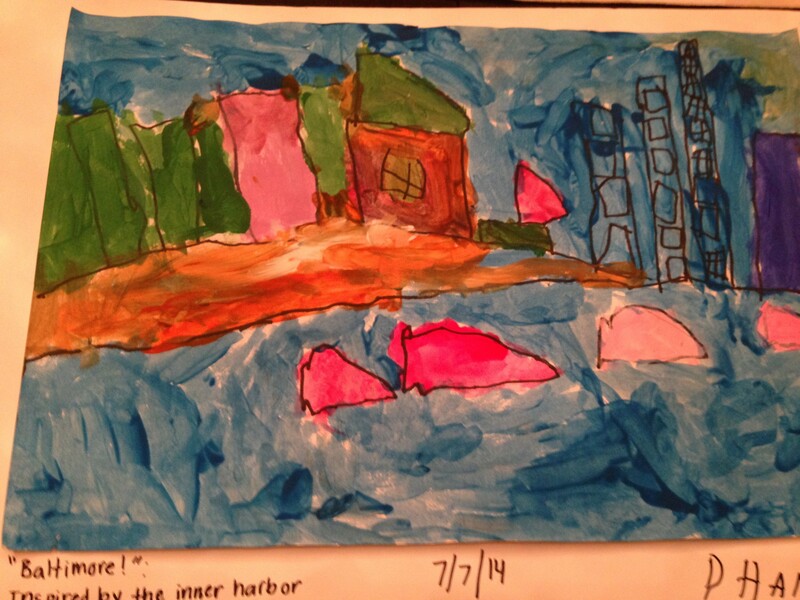 Led by two camp instructors from The Painting Workshop, Rachel Stein and Elisabeth Willis, kids made paintings inspired by all things Baltimore—the harbor, rowhouses, local food, etc. 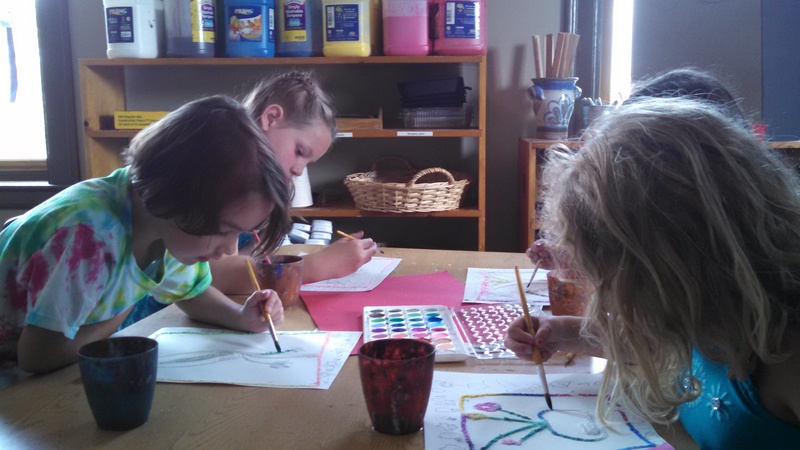 Each day they worked on one painting as well as had lots of free-drawing time and afternoon crafts. 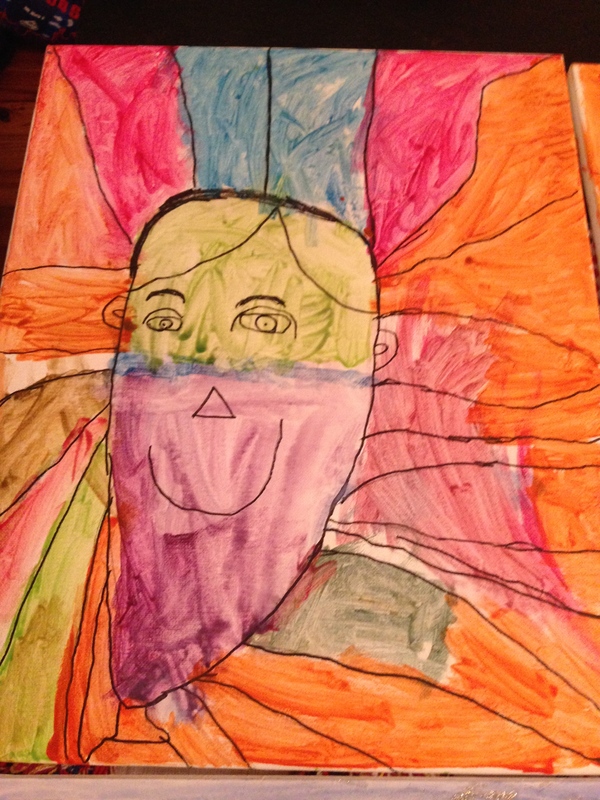 Their culminating project for the week was self-portraits . . . on actual canvas! The artist-campers really got the message. They experimented with colors, patterns, and actual brush techniques to their hearts’ content. They also “expressed” themselves in other ways—a table of several girls quietly sang “Let It Go” as they worked on their self-portraits (perhaps more than one envisioning herself triumphing over obstacles just like the beleaguered Princess Elsa). Meanwhile a table of boys sang “We Will Rock You” and did an admirable job of keeping even the drumbeats hushed so as not to disturb anyone else. Despite all the “self-expression,” going on, the atmosphere was calm and productive. Spills were handled without fuss, and the kids were always reminded to keep working until they finished. “I want to work with kids and art in the future. I’m thinking about becoming a teacher,” said Ms. Stein. She has been with The Painting Workshop for 3 years. Ms. Willis brings an impressive amount of experience to her role as well. She has both a Bachelors of Fine Arts in Art History and a Masters in Art and Teaching from Maryland Institute College of Arts (MICA). She freelanced after graduating in 2011 to spend time on her art but would like to become a high school art teacher or work in the education department of a museum. She has been with The Painting Workshop for the last 3 months. The day starts out with free draw (and each child got a folder to collect their drawings to bring home at week’s end). About midmorning when everyone has gotten the wiggles (and the squiggles) out, they move on to the main project of the day. For the self-portrait day, Ms. Stein and Ms. Willis gave step-by-step instructions involving sketching out the face with a pencil and then going back over it with a Sharpie to make the lines clear. After that, each child got a mixing plate with blobs of primary colors and went to work. For their afternoon activity, the artist-campers were going to make habitats for the crabs they had sculpted earlier in the week. Those are some lucky crabs! “Creativity! 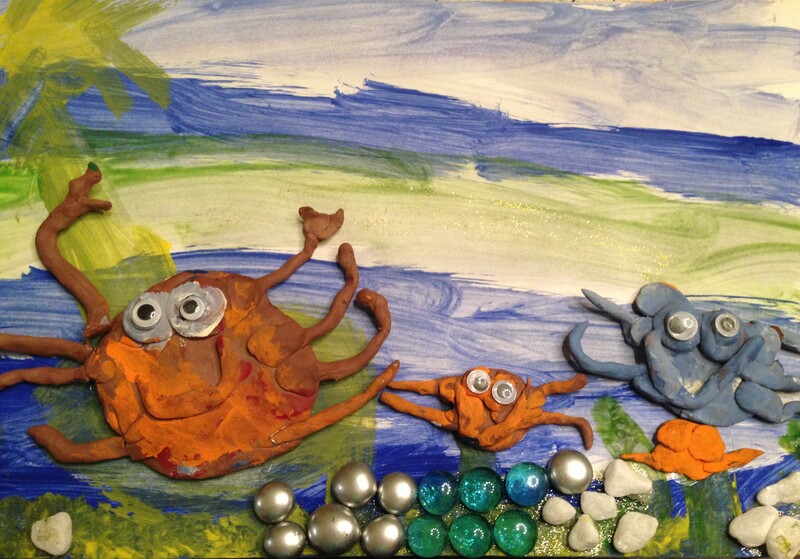 Art Around the World Camp” begins 7/14 and continues through 7/18. Artist-campers will create their own passports and focus on the indigenous art of each country they visit, such as aboriginal paintings in Australia, pottery in Greece, rice paper and pagoda prints in Japan, craft papier-mâché maracas in Spain, and beautiful landscape paintings in France. Water covers more than two-thirds of our planet. Within it, we find amphibious life of all description, and fauna and flora that exist only in the mysterious world of the sea. This camp celebrates the waters of planet Earth–through painting, drawings, sculpture, and of course the use of water in art projects! The geology of the ocean, the uses of the ocean, the wonder of the sea–it’s a watery week of imaginative fun! The outside world comes alive in this camp where we are inspired by nature. From leaf rubbings and clay pressings, to plein-air painting, and sponge paintings of trees, we celebrate nature through our art! Who doesn’t love dragons? We will look to the art of Asia for inspiration, as well as Dragons in medieval times, and then closer to home with Maurice Sendak and his book, Where the Wild Things Are. Projects will include sculpture, puppets, jewelry, paintings, and more. Can you listen to the sounds of art? What is the overlap between the artistic expressions of music and visual art? Let’s find out in this multi-faceted camp experience. We will create our own instruments, explore how sound and music affects our art, and have fun! Would you like to register your child(ren)? Please go here. 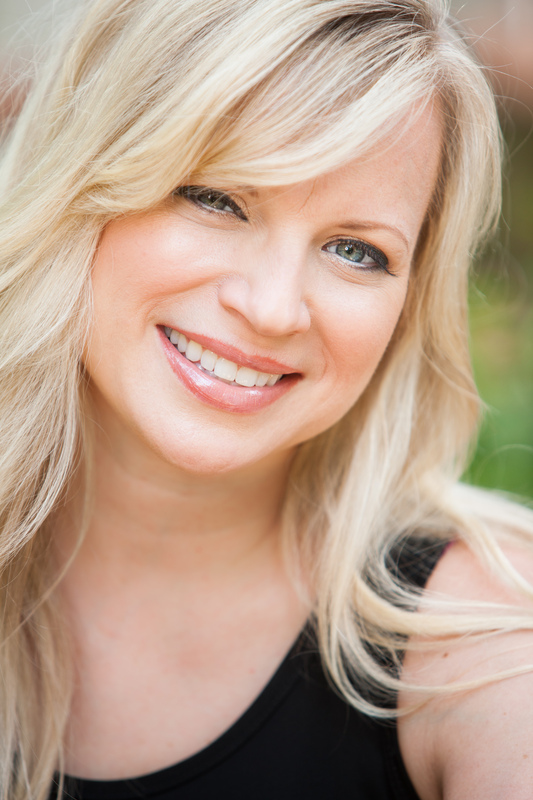 Drama Camp instructor, therapist, actress, and mom, the illustrious Alex Hewett! 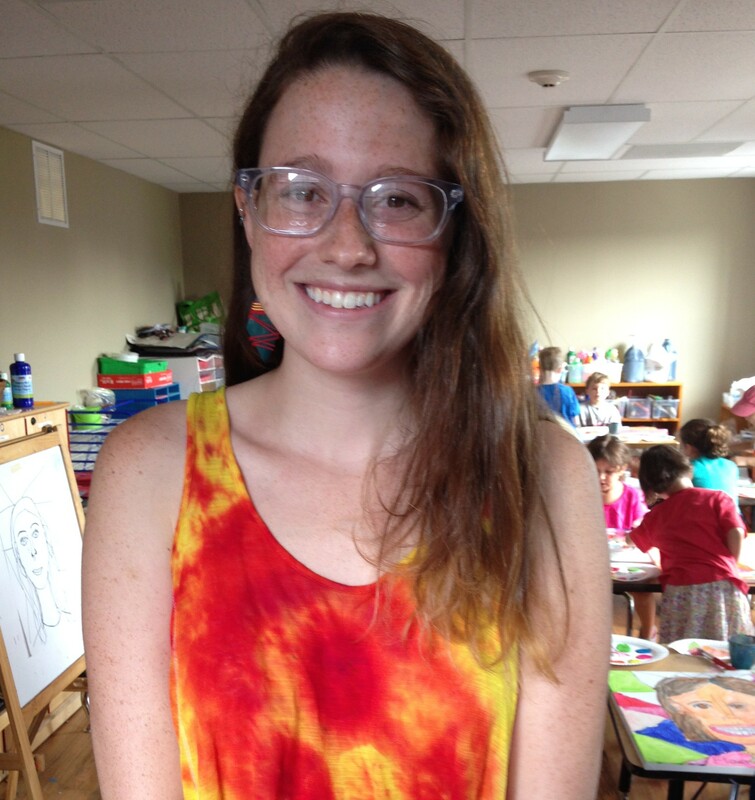 “Things are great,” said Alex Hewett, The New Century School‘s Drama Camp Instructor on the last day of her 3-week stint. “This is my third year here, and it’s funny because my first year here, I taught for 1 week; the second year, 2 weeks, and now this time I had 3 weeks!” That’s because it became increasingly apparent that she’s terrific—inspirational, committed, and lovely both inside and out! Her 3 weeks were one with pre-K and K–aged kids for a half-day camp, the next week was elementary for a full day, and this last week was with kids entering K or 1st- or 2nd-grade. “I know I’m billed as a drama teacher,” she explains, “but I prefer to call it ‘theatre’ instead because we laugh mostly—it’s not so dramatic. [Beat] But there is drama with this age.” (We laugh.) “It’s intense fun. I had such a great group of kids.” Her approach is really very effective. She is trying to instill in her theatre students much more than an ability to project their voices, although such skills necessary for braving the footlights are certainly touched on. What she is modeling is something akin to life skills, a way of being that allows full expression of oneself while respecting and leaving plenty of space for everyone else around to also be and express themselves. This technique is fundamentally about good communication and confidence-building: “Really communicating with your eyes to show that you’re connected is one example,” says Ms. Hewett. “If you are going to go on to become an actor, you need to have life in you to tell a story, and a lot of that comes from your eyes and from your voice. Some of the skills that we work on translate into the real world, such as being a person who feels good about himself or herself and who can communicate with others. Those are really basic social interaction skills that I think can be enhanced, because if you don’t feel good about yourself, it’s going to be hard for people to believe in you, if you don’t believe in you.” Parents, even if your kids are not planning to tread the boards one day, they are certainly going to walk away from drama camp with some important new skills and increased self-confidence. In joining acting skills with life skills, Ms. Hewett reveals her yin-and-yang instructional style, and that wholeness is evident in all aspects of the camp, including the overall structure: “One of the things I encourage in theatre is using your own mind and being creative without following rules, but yet we still have to incorporate rules in order to keep everyone safe, so it’s a delicate balance,” she said. “The balance of what I’m trying to achieve is having some structure and getting the kids to listen but also getting a little silly and being creative.” So there is freedom within certain limits, hard work relieved by playtime. It’s quite Montessori-esque, not to mention oh-so TNCS! We are playing, basically. We do a lot of playing; it’s mostly fun. 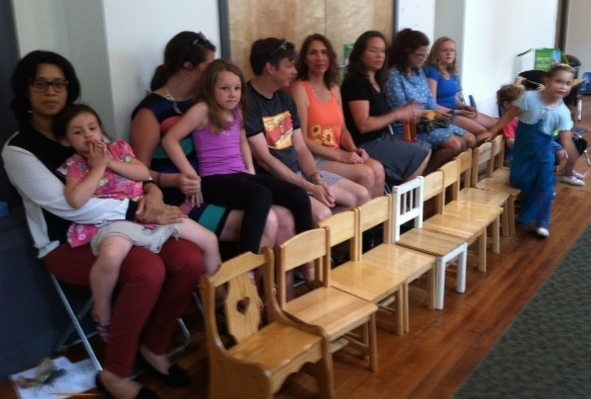 We do a lot of silly exercises, like The Laughing Chair. If someone walks into the room who is in a bad mood or is having a bad day, that energy can bring everybody else down. Or not paying attention or not following the rules—that disrupts everybody, so I like to try to reinforce the positive by saying, ‘even if you feel crummy, you can make someone else feel better’. Even though “The Laughing Chair” is a way to let loose and have a little fun, it incorporates lots of other important skills. The exercise is really about connecting with each other,” says Ms. Hewett. The way it works is that someone sits in the designated chair, and somebody else tries to make him or her laugh. “You can’t touch them or tickle them or throw anything at them or push them out of the chair. But what can you do to make them laugh? Meanwhile, the sitter’s goal is to not laugh. If you laugh, you’re out.” Kids this age tend to use pratfalls and their whole bodies to make somebody laugh. But they learn to refine and particularize their comedy routines according to who is sitting in the chair. They start to learn to read facial and emotional cues, although some sitters are simply “unbreakable” as you can see below. The audience eagerly awaits the performance of The BFG (Big, Friendly Giant). We worked really hard on this scene, and the timing of everything had to be perfect. Everybody had a part (everybody wants ‘THE’ part, but it all kind of worked out that everybody had enough to do and everybody was satisfied with their roles). We had to rehearse it over, and over, and over, and at times I heard, ‘this is boring,’ or, ‘I’m bored,’ and I said, ‘well, you know, if you really want to do something well, you have to repeat it,’ and in the end they were all happy. It was nice to watch them grow in that process. Stretching, yoga, and breathing were other exercises they did regularly. The goal of the Week 3 camp was to get up to 15 minutes of quiet mindfulness. “We got up to 10. For some it was great; for others it was a real challenge to just listen to their breathing. But when you’re on stage, you have to be aware of yourself and of everything around you. So knowing how to focus and center yourself if you get nervous (because everyone gets nervous—I still do) is vital, and your breath is one of the things you have control of in this world,” said Ms. Hewett. TNCS students are already accustomed to this practice. “That makes a lot of sense. You don’t know what children are walking out of, even if it’s just the stress of trying to arrive at school on time and being too tired to start the day,” she said. It’s a great way to get them grounded and ready for the day. “One of my favorite things I was told when I first started out,” says Ms. Hewett, “is that when you walk into the theater, it’s a sacred space, and it’s a privilege to be here.” So, at theatre camp, the kids take their shoes off to symbolize that whatever troubles they may have been experiencing are left at the door. “We become immersed in an imaginative world. There’s something joyful about that. Stories are really powerful, and art can make a difference in people’s lives.” For instance, with the Week 2 older kids, who happened to be all girls and were obsessed with all things Frozen, Ms. Hewett helped them to see that women can have strong roles other than princesses. “You can be the king; you can be a dragon. Or, you can be something completely different form who you are—that’s the power of the theater.” They also read Amelia Earhart as another example of a person who triumphed over her obstacles and embraced her differences to become a role model for all women. Today I Will Fly! is from the popular Elephant and Piggie series. 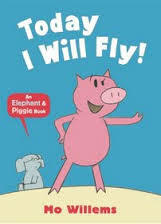 Other stories they put on included Today I Will Fly!, by Mo Willems, which demonstrates the value of perseverance and a little creative problem-solving. “If someone tells you you can’t do something, don’t get discouraged, just keep trying harder.” Charlie and the Chocolate Factory is about consequences. The characters who behaved badly and didn’t heed warnings met with very horrible (albeit funny) demises, whereas Charlie Bucket, who was the opposite of his demanding, impatient fellow golden-ticket winners, is the hero of the story. “Being patient and kind always wins,” said Ms. Hewett. Fortunately, as drama camp shows, these can be learned traits. In essence, drama camp teaches nothing less than the art of being.